If you are looking for the the first three editions, I had it on one of my other blogs. I decided to move Show Your Stuff blog hop here. I don't have really many rules, just link up anything you are proud of and want to show off. 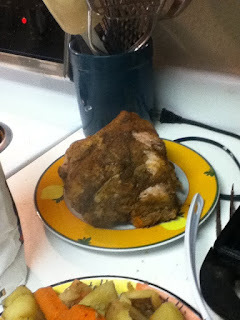 Chirstmas Eve my loving husband slow cooked a pork roast for dinner, he put it in before going to church. We were welcomed home to an awesome smelling and tasting pork roast. Thanks for visiting me and inviting me to your blog hop! I'm your newest follower and look forward to reading more of your posts. Enjoy the ravioli I linked up! Glad to be your newest follower! Thanks for the invite! We are all linked up and now following you! Thanks for the invite! All linked up. Best of everything to you and your family in 2012. Happy New Year! I added my Sweet & Salty Neighbor Gifts tutorial-great for Xmas, New Years Parties, or whenever! Thanks for inviting me over. Linked up and following!!! Thanks for the invitation, I linked up the Potato Roast and I'm following :) Have a great week!